There have been plenty of successful Brazilians in the orange of Shakhtar Donetsk in the last decade. Douglas Costa (Bayern), Fernandinho (Manchester City), Willian (Chelsea via Anzhi) and Luiz Adriano (AC Milan) are just four of the Brazilians to establish themselves in European football in Donetsk prior to big-money moves to some of the best clubs on the continent. The latest in line for a big move is the midfielder Fred, brought to Ukraine in 2013 as replacement for Fernandinho. Five years later he might be set to replace Fernandinho again as Manchester City have been linked with the Brazilian, as have city neighbours Manchester United. Fred is the next big thing to catch the attention of some of Europe’s richest clubs and it’s easy to understand why. As mentioned above, Fred joined Shakhtar in 2013 from Internacional after previously spending time in the academies of Atletico Mineiro and Porto Alegre. Since then he’s been a mainstay in the side and been influential in their trophy haul of two Ukrainian league titles since then, with them looking likely to add a third title in Fred’s time at the club this season. The success has obviously led to European football with Shakhtar appearing in both the Champions League and Europa League in Fred’s time at the club. This season, Fred has used the experience he’s built up over his time in Ukraine to really thrive in their Champions League run which ended last week with their loss to AS Roma. Despite the defeat the 25-year-old Brazilian stood out, just as he did in their group stage matches against Manchester City, Napoli and Feyenoord. With the summer transfer window fast approaching, Fred is a name on many coaches wishlist. Let’s look at what he brings to his team. Fred has played in a 4-2-3-1 for Shakhtar this season and he’s usually played in the right-sided central midfield position next to Taras Stepanenko. From there, the Brazilian has been tasked with starting attacks and recycling possession as well as finding penetrating passes when higher up the pitch. Defensively, the structure has been one of positionally-orientated defending where Fred and Stepanenko have provided the stability for Shakhtar’s free-flowing attacking football under Paulo Fonseca. Fred’s technical ability is very impressive and his dribbling ability in particular is something to admire. His first touch and close control is terrific and often sees him wriggle his way out of tight or pressured situations. This ability, coupled with his acceleration often sees him dribbling past an opponent in midfield before accelerating into the empty space behind the opponent’s midfield line. In his eight Champions League matches this season, Fred averaged 2.8 dribbles per game, a high number given the position he plays in midfield. By contrast, Paul Pogba (1.40), Nemanja Matic (1.14), Ilkay Gundogan (1.57) and Fernandinho (0.83) players in similar roles in the clubs he’s been linked with don’t get close to that number. To do this in Champions League games against such good opposition as he’s faced highlights his quality to break lines with his dribbling. Given the links to Pep Guardiola’s Manchester City you’d expect Fred to be a good passer. I’m happy to inform you that’s certainly the case. Fred averages 57 passes at a completion rate of 86% for Shakhtar in the Champions League this season, but those stats alone don’t tell the whole story. Over 60% of the 57 passes he averages per game are made forward and he averages 1.13 chances created, bettering Pogba, Matic, Fernandinho and Gundogan again. Fred always keeps his head up and scans the pitch for good options and looks for proactive passes forward which hurt the opposition. Let’s look at a few examples. 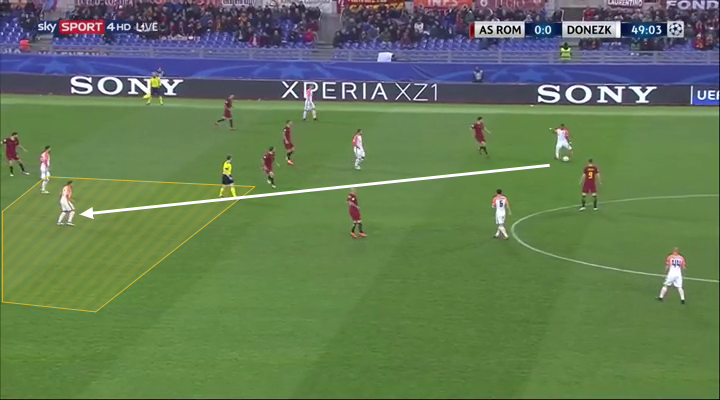 In the image below, Fred identifies the space within Roma’s defensive structure and threads a pass through Roma’s midfield into his teammate in a great position between the lines. Below are two images of a trademark Fred pass this season; given his deployment in the right-sided central midfield position and the fact he’s left-footed, Fred often looks to play a lofted diagonal ball into the space behind the defensive line to find a diagonal run from a teammate. This is the type of ball players like Leroy Sané, Raheem Sterling or Marcus Rashford would love to receive. Against Roma above as their team moves forward and miss the run of Taison, and below against Dinamo Zagreb as Bernard make a great run. Fred also has the ability to play incisive through balls along the ground, which he showed when storming forward through Napoli’s midfield and then thread a pass through to put Taison through on goal. Aside from his proactive passes into dangerous areas, Fred also recycles the ball well which helps his team to control possession. With his superb technique, strength and low centre of gravity, Fred is also highly resistant against pressure and can either dribble out of pressure or use his vision to find a clever pass. Defensively, Fred gives you intelligence, energy and excellent individual defending. He averages a whopping 2.9 tackles a game, dwarfing the contribution of the likes of Pogba (0.8), Matic (1.57), Gundogan (1.14) and Fernandinho (1.5). The reason is the excellent nature of his 1-vs-1 defending. His low centre of gravity and quick feet allows him to quickly sprint into pressure and set himself up in a great body position when defending 1 vs 1. He’s always side on to steer the opponent the way he wants him to go while simultaneously being ready to move back, forward or to the side. His quickness is an undeniable asset and when he gets close he uses his strength and balance to win the ball against his opponent. An example of his body positioning when pressing can be seen below. Fred is also an highly intelligent midfielder who reads the game well. His stat of 1.1 interceptions per game doesn’t do this asset enough justice but he often reads the pass the opponent will make and then uses his speed to quickly sprint forward and stop the pass. One example of that is in the scene below as he reads Kostas Manolas pass and steps in ahead of Kevin Strootman to win the ball and start a counter-attack for his team. Would he fit in at the two Manchester clubs to whom he’s repeatedly been linked? I’d say definitely. At this moment in time I think he would adapt quicker to Manchester City’s style of play given he’s played in a team at Shakhtar which also preaches a positionally-orientated defence and a heavy emphasis on possession and creating superiority with the ball. Fred would fit in well, but would likely play in the Fernandinho role which is a position with more defensive responsibility then he’s used though. I think he would be a great fit though. At United, the change would be bigger as Jose Mourinho uses a completely different style of play to what Fred is used to with Shakhtar and also Brazil. The change to a man-orientated defensive system would probably take time, but on the other hand Fred is exactly the type of combination of energetic ball-winner and playmaker United crave. A midfield three of Fred, Matic and Pogba would without a doubt improve United’s chances to compete next year, regardless of Mourinho’s tactics. Adding his defensive quality to his passing and technique and you realize Fred is a special talent. He looks like he really could develop into a fantastic, complete central midfielder and at only 25 he definitely has the future ahead of him. All stats collected from Squawka and whoscored.com as of 15 march 2018 and refers to Champions League-fixtures.